I recently stumbled across the Mont-Bell Crushable Lantern Shade at a small boutique outdoor store and I had to buy it. Every time I head into the woods I try and strip down my gear set to the bear essentials, but, I always try and bring 1 or two luxury items that make the trip more comfortable as my reward for slashing weight. Things like an extra thick pair of socks to wear in my sleeping bag, a lightweight pillow, a “premium” snack, or a lightweight pair of flip flops for around camp. Lately, because its winter and it gets dark so soon, my luxury item has been a Black Diamond Orbit lantern. Its a great way to light up camp – not as cozy as a fire but way better than sitting around in the dark. The Orbit is one of the best lanterns I’ve ever used. Here is the thing with lanterns though – no matter how awesome they are they always weigh more than I want to carry. The Mont-Bell Crushable Lantern Shade solves my problem and lets me carry an additional luxury item! It works by encasing a light source (I stick it on my headlamp) to defuse the light – turning anything into a lantern. I weigh all my gear to see if it makes the cut – the Mont-Bell Crushable Lantern Shade doesn’t even register on my scale. 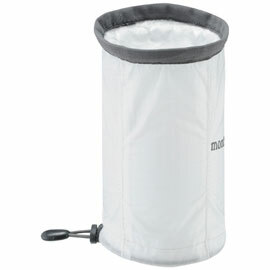 Its durable and can be stuffed in any random pocket without worry. While its not quite as good as a dedicated lantern I think this thing is truly brilliant. Lanterns weigh too much. The Mont-Bell Crushable Lantern Shade literally weighs nothing. If you want a lantern to light your campsite or tent but don’t want to be weighed down by one this is exactly what you have been looking for. 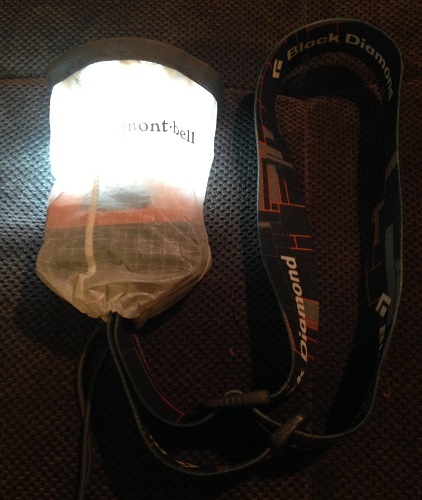 The Mont-Bell Crushable Lantern Shade attached to my Black Diamond Storm headlamp. This entry was posted in Activities, Alpine Mountineering, Activities, Backpacking, Brands, Black Diamond, Gear, Headlamps, Gear, Lanterns, Brands, Mont-Bell, Product Review, Activities, Ski Mountaineering.